This weekend I was out driving up Hwy 51 in Mississippi and listening to some blues. I was just south of Memphis and entering Horn Lake, MS and saw the sign for the Memphis Jellystone Park™ Camp-Resort. 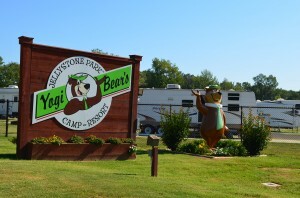 I’ve seen the signs on the interstate for it and have driven by the Yogi Bear statue several times and have always said I’d check it out one day. Well, Sunday happened to be the day. The last time I had driven by the park there seemed to be some construction visible from the highway. Now in that space are lots of new camping spots for trailers. I drove down a bit more and found the “Ranger Station“/registration office building. 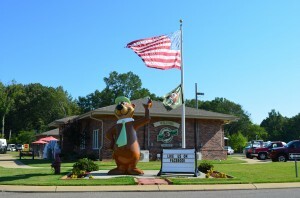 Inside was a small gift shop which had some pretty cool Yogi Bear and Jellystone souvenirs, along with the usual tourist info fliers and such. 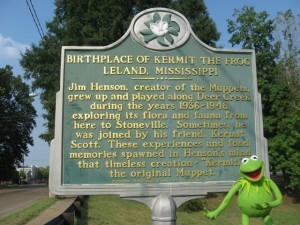 I picked up one for the park and a few other tourist sites up in Memphis (just a few miles north). As I left I noticed some bouncy-slides, a shuffleboard court, and a pavilion. If you love picnics– and Popeye, do I have an event for you! 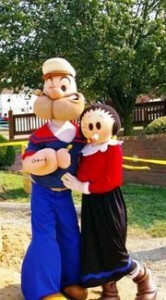 It’s the Popeye Picnic in Chester, IL– Home of Popeye and birthplace of Popeye creator Elzie Crisler Segar. It’s just around the corner on September 9, 10, and 11. According to their Facebook page, events include Wimpy’s Wiener Dog Races, Jeep’s Jivin’ Caricatures, Illinois Championship Alliance Wrestling, Popeye’s 5K Run/Walk & 1.5 Mile Fun Run/Walk, Poopdeck Pappy presents magic & more, Official Popeye Fanclub Banquet & Live-Broadcast Radio Show, Castor Oyl’s Carnival Rides, Swee’ Pea’s Petting Zoo & Popeye’s Pony Carousel, Extreme Inflatables, Annual Popeye’s Pet Show, Popeye Parade, live music at Pirate’s Cove, and food! 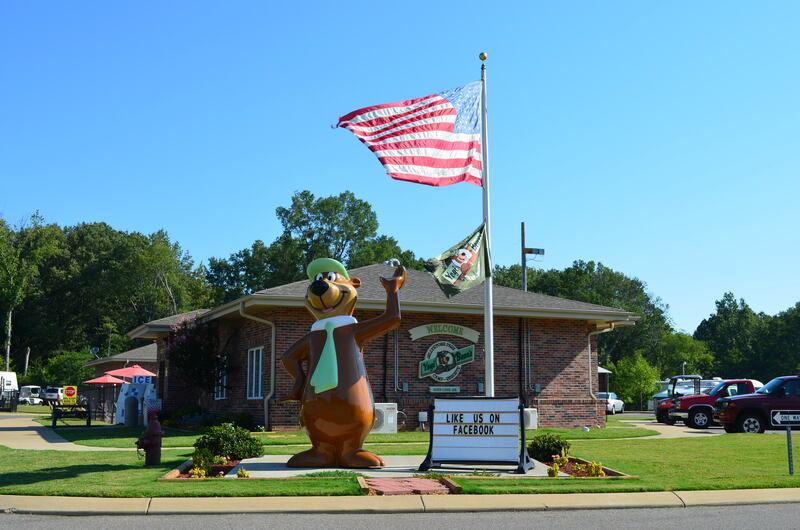 I’ve never been before, but I’ll be heading up I-55 to Chester with a couple friends on Saturday or Sunday- and if we’re not too stuffed from the Popeye Picnic we might just have to make a stop in Sikeston, MO for some throwed rolls at Lambert’s Cafe! 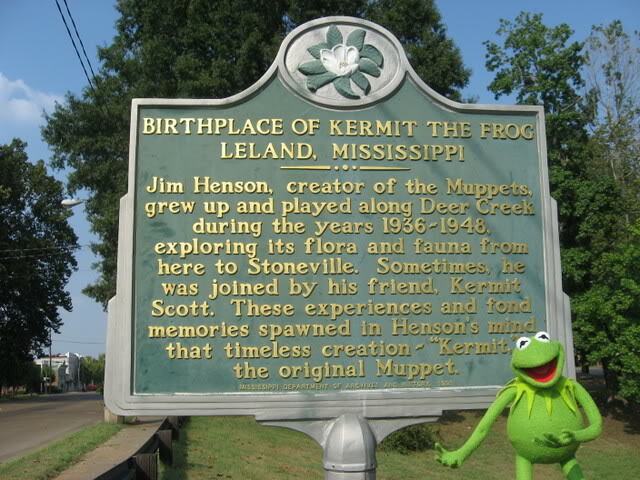 Oh, and coming soon- Leland Frog Fest in Leland, MS– the birthplace of Jim Henson and Kermit the Frog! I’ll tell you more about it next week.